When we say the words “menstrual cycle” or “feminine cycle”, we’re talking about a lot more than the days of your period. What we’re referring to is the entire month that creates the ebb and flow of your hormones, emotions, the expression of your physical body, and the quality of your life! What is the Feminine Cycle? When we say the words “menstrual cycle” or “feminine cycle”, we’re talking about a lot more than the days of your period. We’re actually talking about the entire month that creates the ebb and flow of your hormones, emotions, the expression of your physical body and the quality of your life! (P.S. this applies whether you don’t have a uterus or have an irregular cycle like a no-show or all-month period. You have a built-in feminine cycle no matter how dysfunctional your endocrine system is right now! In fact, if you fall into any one of these cycle abnormalities or one we haven’t mentioned, you’ll most definitely benefit from the Syncing With Your Cycle approach.) The entire feminine cycle is roughly 28 days. Each of the 4 phases of this cycle are roughly about 7 days (give or take, depending on your cycle length). Day 1 begins on the very first day of your “full flow” period. If you’re dealing with low progesterone or another imbalance between progesterone and estrogen, you may have spotting before your actual period starts. Don’t count spotting as Day 1. Instead, wait until you get your full-blown period to start counting. Before we jump into the definitions of each cycle, let’s clarify a few things. First and foremost, in order to sync with your cycle, it’s cruicial to track your cycle! 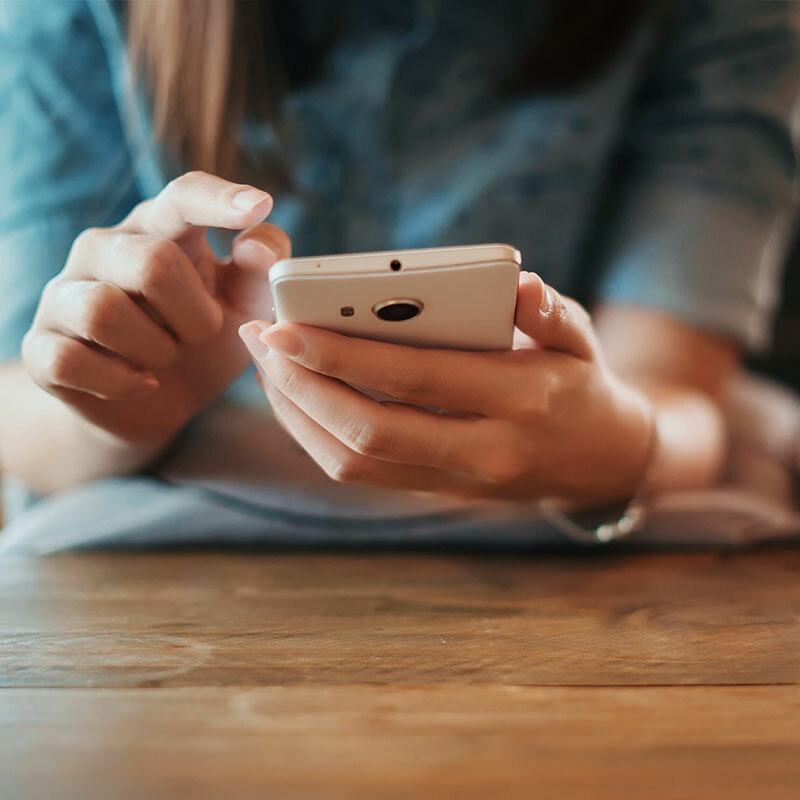 We love the MyFlo app, but there are plenty you can choose from. Next, it’s helpful to figure out roughly the time you ovulate each month. We suggest getting some cheap ovulation test strips to track your first few cycles. (Note: This isn’t mandatory. You can use the general outline we offer instead.) Once you have a general idea of when you’re ovulating at this point in your life, you won’t have to track this month to month. Why Do the Phases of the Cycle Matter? Each phase of the cycle is characterized by what happens in the physical body, our emotional landscape, and how we are primed to spend that time. 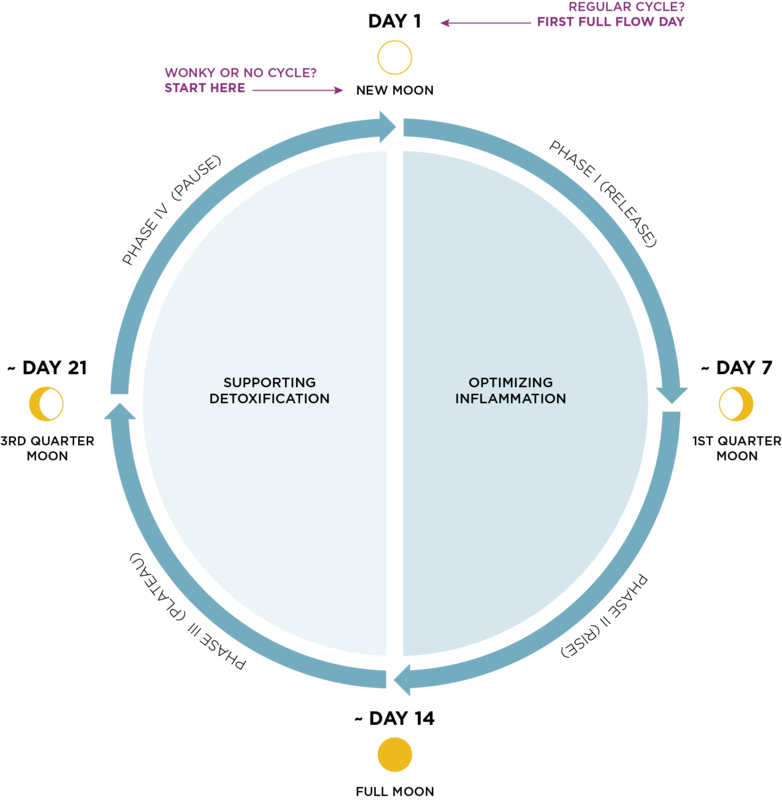 Let’s cover the four phases individually, so you can understand the flow of each, and begin to reap the benefits of living in sync with your cycle. These are Days 1-7 of your cycle (where Day 1 is the first full flow of your period). If you don’t have a reliable cycle to track, go by the cycle of the moon from the New Moon (Day 1) to the Quarter Moon (7 days later). The Release phase is a period of release, rebirth and transformation. Both physically and emotionally, we are called to release what we no longer need, so we can have space to consciously rebuild more of what we desire in our world. The Dark Moon Sub-Phase Days 1-3 of the Release phase are quite unique. This is when you’re most intuitive, most ready to identify what’s working or not working in your life, and it’s when you should get clear on where this upcoming cycle is taking you. Yes, this applies to health goals (like treating your hormonal acne or making your periods less painful) but also extends beyond that to an overall happy life! This Dark Moon Sub-Phase is also when you feel most physically impacted by your period, and it’s especially helpful to set aside a couple days each month to honor your body’s need to rest, restore and renew. The first few days of your cycle can bring out a sense of loss of what you are letting go of, and this is totally normal and natural. As you take the time to honor everything you have experienced and learned from, you give yourself space to recover and replenish from a more deliberate and purposeful place. This is a time for self-love, intuition, and solitude or being in the presence of supportive loved ones. Physiologically, this is the lowest point of your hormones before the new cycle starts again. While this phase seems like there isn’t much going on, it is a critical time to build the foundation for a happy and healthy cycle for the upcoming 4 weeks. As your period finishes, your ovaries are getting the signal to build up multiple eggs so that ovulation (and possible fertilization to make a baby) is possible. At this time, it is crucial to help the ovaries get the appropriate signals that allow one egg to reach maturation and trigger the hormonal cascade involved in ovulation. When ovulation happens at the set time, we have predictable, less painful, and regular cycles. Regardless of whether you plan on having a baby in the foreseeable future or not, healthy cycles with appropriate ovulation is key to feeling healthy, happy and in the drivers seat of your life! Building up the body with sufficient nutrients to power cellular activity and lower inflammation (so the hypothalamic-pituitary-adrenal-ovarian axis isn’t suppressed) is key this week. This is also the time to take it easy physically. This doesn’t mean giving up on your fitness and body goals, though! Rest, so you can rise up replenished and cleansed. Try decreasing the intensity of your workouts, and move your body in gentle and intuitive ways. 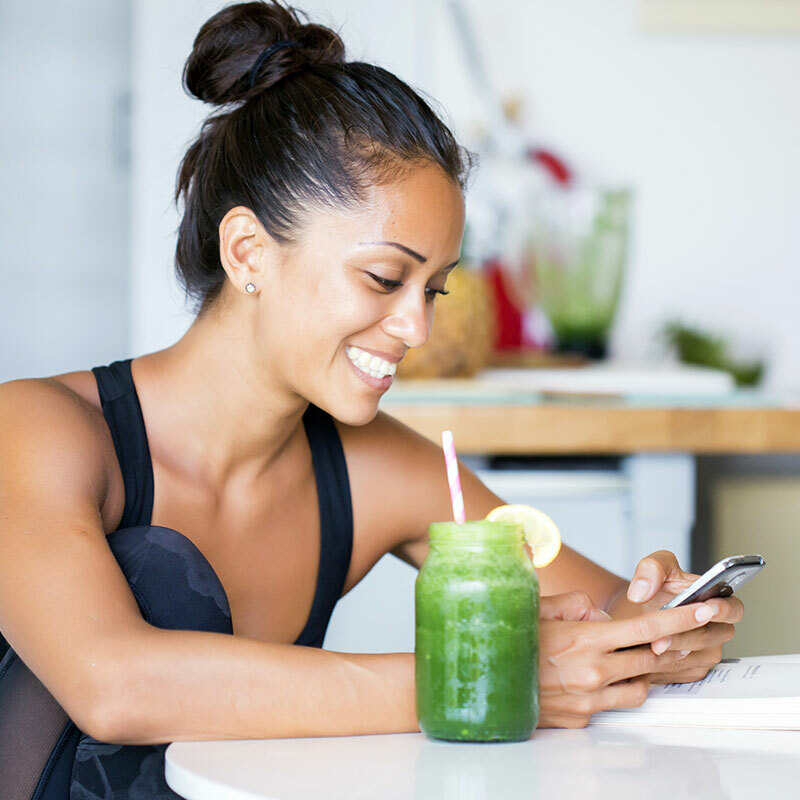 Once you’ve finished reading about the 4 phases of the cycle, you can read more about how optimizing inflammation and detoxification impacts hormonal, pelvic and feminine health. These are Days 7-14 of your cycle (or Day 7 to the time of ovulation). If you don’t have a reliable cycle to track, use the cycle of the moon from the Quarter Moon to the Full Moon (7 days later). This is the most powerful and extroverted time in your cycle, when we come forth as the powerful female figures of the world. This is the week to move, create, build and command. Take concrete and powerful steps toward the goals you identify in the Release phase to make them your reality. This is akin to what is happening in the ovaries as one egg takes over control of communicating with the hypothalamus and pituitary and begins to ramp up the products of hormones that will dictate the rest of your cycle. Physiologically, estrogen production in the growing egg begins to remind the pituitary that ovulation should be occurring shortly. The pituitary, in turn, makes this a reality by creating adequate levels of hormones called LH and FSH. As the LH surge is released from the pituitary (this is what you measure on a home ovulation test), the ovaries get the message to release the developed egg into the fallopian tube. This is a busy time for the entire body as we gear up to make ourselves a welcome home for creating and sustaining another being (or our “work babies” if you’re more focused on your career at this point in your life). Because of this, it is important to use our power in ways that protect, support and build up our internal environment. This is an active week, and you’ll feel great making changes that will serve you for months and years to come. Break a bad habit or begin a new way of eating! Your determination and clarity are high right now, and it’s easier to stick with new ways of doing things. P.S. Looking for nutrient-rich recipes to fuel a healthy endocrine system? Check out our Nutrient-Rich Recipes section! Use this week to establish new routines, so they’re already in place when you feel not-so-motivated. You’re at your strongest, fastest and most determined this week! 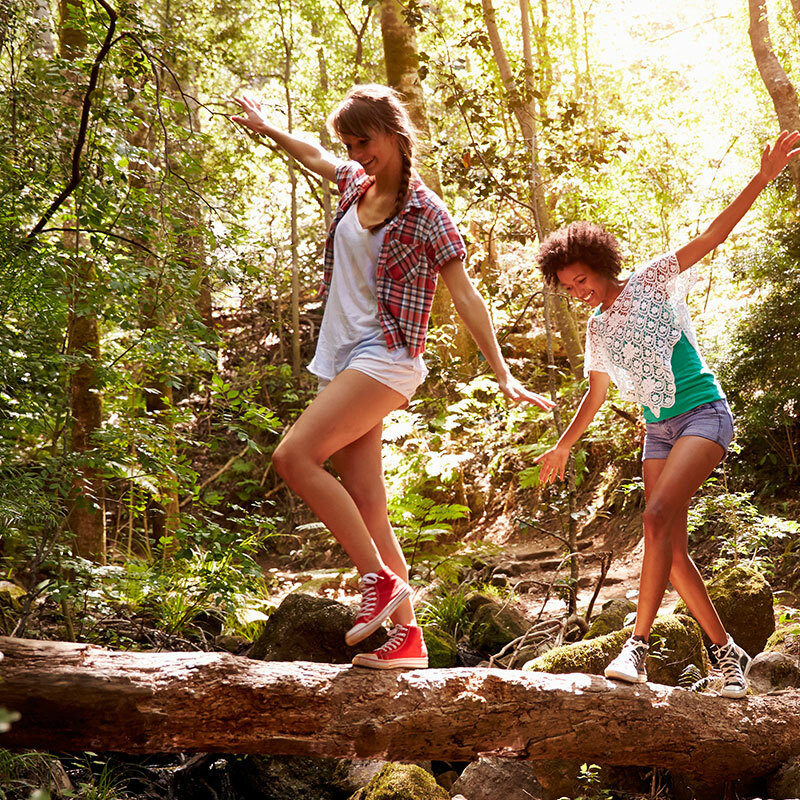 Take the time to move your body in all the wonderful ways it can serve you. This is an ideal time to try a new fitness routine or to begin taking daily walks with your family or friends. These are Days 14-21 of your cycle (or you can look at it as the time of ovulation to ~7 days later). If you don’t have a reliable menstrual cycle to track, use the cycle of the moon from the Full Moon to the Last Quarter Moon (7 days later). Ovulation and the week afterwards is a time to enjoy the fruits of our labor. This is the week where we feel our hormones rising and evening out, and with them, our sense of stability. (Having low progesterone or any other luteal phase defect will leave you feeling groggy, moody and off-kilter!) We feel empowered by the decisions and actions from the week before and begin to nestle more easily into a new way of being. This is a great time to focus on following a routine and get more comfortable with the flow of our lives. This week is a fantastic time to make to-do lists and follow through on them. Ensure your to-do list is filled with things that are most important to YOU, not the people around you. Fill your daily to-do list with activities that nurture your spirit in addition to the work we need to do to turn our dreams into reality. You can do this by making separate to-do lists for work, home and self-care; then treat each to-do list with equal importance and care! Physiologically, the collection of cells used to house the egg that was just ovulated begins to collapse and secrete progesterone. This progesterone has a calming effect on our minds and body, so it’s a great time to methodically put one foot in front of the other for your goals. As the hormones build and plateau in the body, supporting the body’s natural detoxification systems becomes more and more important. There are also hormone-disrupting toxins and estrogen-like compounds in the environment that are important to protect against (even if you have low hormones). The Plateau phase is a great time for finding balance with your dietary goals. In order to fuel your body successfully long-term, you must find a way to approach yourself compassionately. This is a great time to stick to your movement goals and see advances as you begin to settle in for the long haul. It helps to keep track of your accomplishments, so you can watch your progress. Whether you’re rocking out a stellar walking routine or shooting for a new Crossfit personal record, the Plateau phase is the best time to establish a sustainable routine. These are Days 21-28 of your cycle (or the 7 days after the Plateau phase). If you don’t have a reliable menstrual cycle to track, use the cycle of the moon from the Last Quarter Moon to the New Moon (7 days later). Our hormonal levels begin to transition and wind down this week. We’ve come full circle! This is the cycle phase all about respecting and responding to your body. It will use its subtle voice, sensations and nudges to guide you in the right direction. Catch up on sleep or increase your complex carbohydrate intake in response to sugar cravings. Take in all of the lessons you’ve learned from your body the 3 weeks before, and apply them to your life for your benefit. This is important because as we optimize and support the high points of our hormonal cascades, we establish a good base for the entire next cycle! One of the most important aspects of this week is good detoxification support. Our modern environments leave us incredibly prone to elevated hormone levels with artificial, half-metabolized, hormone-like compounds floating around in the bloodstream that cause miserable symptoms (including but not limited to PMS, hormonal acne and spotting). While we are metabolizing and removing toxins and unnecessary hormones from our bodies, this is the time to slow down mentally and physically in preparation for the upcoming Release phase. It is best to approach every part of yourself with gentleness and compassion this week. Cravings and emotions tend to come up at this time, and it is a beautiful opportunity to explore why we have chosen to believe the things we believe or rely on the things we rely on. Instead of beating yourself up for not being perfect at sticking with your new diet, ask yourself why you crave what you crave. Would you benefit from comfort? How can you provide more comfort for yourself? Do you need support? Who and what is a healthy source of support in your life? By looking at things from a perspective of love for yourself, we can let go of all the “shoulds” that make us feel small and not in control. Begin to express gratitude for all the ways you “mess up” so you can see things as a learning opportunity. When you stop examining yourself as small and “wrong”, you’ll become in tune with the strength you have inside. At this point in our menstrual cycles, our ovaries begin to resorb the portion of the ovary that is in charge of supporting and creating good hormone levels. As long as the rest of the cycle went smoothly, the active hormones in the body will maintain and thicken the lining of the uterus in preparation for conceiving a baby. Even if you’re not trying to get pregnant, this is critical because a lack of stability in the lining of the uterus will cause unpleasant symptoms like spotting, hormonal acne and a painful period. As the ovaries absorb the tissues that maintain hormone creation, the entire hypothalamic-pituitary-adrenal-ovarian axis gets the message that it’s almost time to have a period, and our hormone levels gradually decline. If your cycle or hormonal landscape is imbalanced, this drop in hormones often triggers the symptoms that led you to find us in the first place! This is the time when your cravings tend to communicate the things your body desires. A craving can signify something you’re missing (for example, chocolate cravings can hint at a magnesium deficiency) or a food sensitivity that’s actually irritating you (like salty chips covered in bothersome canola or sunflower oil). Cravings can also signify your spirit is in need of something more, like more time to relax or more support from your loved ones. As your hormones decrease over the Pause phase, it’s time to get back to a gentler way of moving. 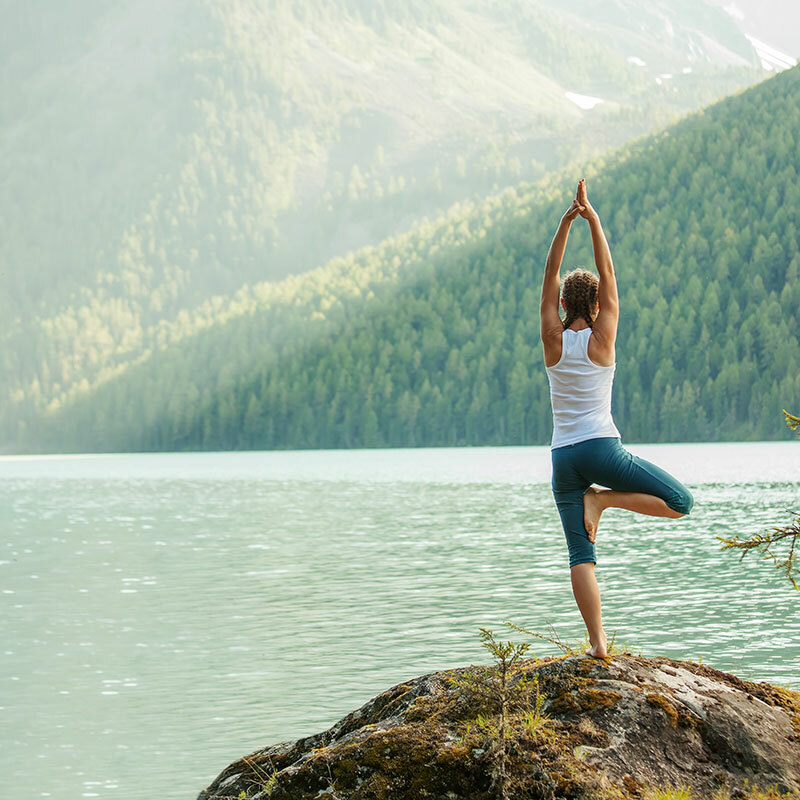 Instead of your usual routine, try out a detox-focused yoga video like this one. The stretching, twisting and flowing will help the detox organs (liver, lymphatics, kidneys and colon) work much more smoothly during hormone removal, setting you up for a wonderful next cycle. 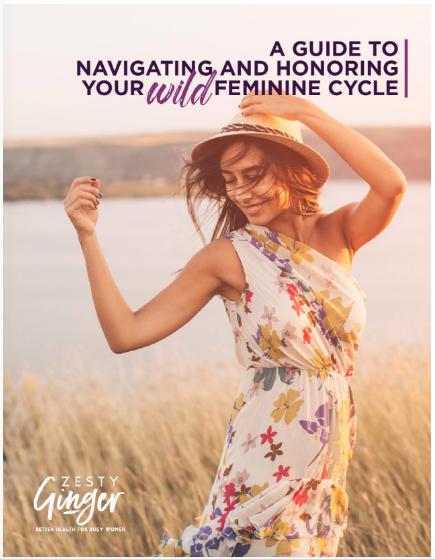 The best way to learn about the 4 phases of the feminine cycle is to begin living more in sync with yourself! If you’re new to this, we put together a free Cycle Guide that explains our simple methodology in an easy-to-implement format. In it, you’ll find weekly rituals, elixirs (easy ways to help support inflammation control and detoxification), movement goals, journal prompts, different ways to minimize hormone-mimicking compounds that cause our female systems to suffer and much more! Looking for even more great content? Read more about detoxification and the optimization of the inflammatory response.